The Laurel Emperor is Crowned! His Royal Highness has gratefully declared today to be a national holiday to commemorate the release of Laurel Emperor, Book 5 of the Steam Empire Chronicles. (Short Synopsis) Fans of Harry Turtledove & S.M. Stirling alike will love the fast-paced action and colorful world building of the Steam Empire Chronicles. In a timeline where Rome never fell & the Dark Ages never came to be, new challenges appear to fracture the still-mighty empire. Laurel Emperor is the heart-pounding, airship shaking, sword-breaking finale to this alternate history & steampunk series. (Long Synopsis) Civil war rages across the fractured Roman Empire in the 1850s. Rightful heir to the throne Constantine Tiberius Appius has successfully repelled the Mongolian invasions, but at a cost. The usurper Sabinus, Constantine’s uncle, rules in Rome, and his forces press through the shattered loyalist defenses, stripped to support Constantine’s campaign in the east. Loyalist and rebel forces converge in Thrace, and as casualties mount, new weapons of war are unleashed upon friend and foe alike. Constantine and his closest allies, the men of the XIII Germania, find themselves once again thrust into the spotlight. As the loyalists march towards the inevitable final battle, they face the true question of war – how much are they willing to sacrifice for victory? The fate of the Empire rests with a handful of common legionnaires, led by the last true scion of a dynasty stretching over a thousand years, in the final novel of the Steam Empire Chronicles – Laurel Emperor. Laurel Emperor – T Minus 1 Day! If you aren’t sure where to start, grab the first book – Brass Legionnaire – for only 99 cents on Nook or Kindle or Smashwords! Excited to share this novel with you tomorrow! Steel Praetorian Now Available in Paperback! With the holidays coming up, I know everyone is desperate to order Steel Praetorian for their friends, neighbors, and family. So, without further ado, here’s the link to the paperback version of the novel! Right now, it’s only available through Createspace, Amazon’s PoD Service, (EDIT NOW UPDATED – AVAILABLE ON AMAZON) but it should be available via Amazon proper within the week, and other print-book channels in the next few weeks. Get your print copy today! Also, if you can contain your reading pleasure, and wait until it appears on Amazon, you can get a discounted version of the ebook if you order the print edition. So if that’s your thing, get double the Romanpunk Adventure at a reduced price! December 1st, 2016 – A date that shall live in Steampunk awesomeness! Steel Praetorian is released for sale in ebook! Book 4 of the Steam Empire Chronicles is now available for sale on Amazon, Smashwords, and Barnes & Noble. 249 pages long, and featuring characters from all the previous novels, plus a focus on a handful of new ones, this novel is action-packed, taking us from the scorching deserts of Mesopotamia to the blood-filled streets of Rome, and half the provinces in-between, it’s sure to impress and entertain! Back Blurb: Emperor Hadrian Appius is dead, and the man responsible is his own brother. Unable to prevent the assassination in IRON TRIBUNE, Senatora Octavia Pelia and her allies flee Rome, leaving the smoldering capital behind them, determined to fight on against their rebellious countrymen. In the east, rightful heir-to-the-throne Constantine Appius faces disaster at every turn, his forces stretched thin against invading Mongols and rebel Romans alike. With the help of new friends and old, a desperate plan is formed. But will it be enough to save the Empire and the throne in STEEL PRAETORIAN? Print Version should be available within a week. I’m excited to share that with you as well. Remember to like me on Facebook and follow me on Twitter for more frequent updates throughout December as I continue building the Romanpunk world of the Steam Empire Chronicles! Salve! In less than three days, we take the plunge into Steel Praetorian. Meanwhile, I’m still cracking away at Laurel Emperor, although (insert random excuse here) progress is not as good as hoped. Tonight’s writing featured General Marius Regillus, of the IV Syrian, in action. Don’t know who he is? Check out Antioch Burns, a novella based entirely on characters created by fans of the Steam Empire Chronicles. Available on Amazon, Barnes and Noble, or Smashwords for all other platforms. Steel Praetorian Available for Pre-Order! Steel Praetorian is now available for Pre-Order on Amazon! I expect to have it up for pre-order on Barnes and Noble too by the end of the week. I am so excited to share this novel with you all. The official release date is December 1st! You can also read more in an interview I’ve done on fellow writer Phoebe Darqueling’s blog – I highly encourage you to go there as well! It describes some of what’s going on in my head, as well as in this book and future books. Steel Praetorian takes us deeper into the story and the political intrigue in Rome than ever before. Order shatters, resistance endures. Our loyalist friends face new challenges, while our traitorous friends uncover plot-twisting secrets. Cities will fall, Royal Houses will rise, and new technology will come to the forefront – but for better or worse? (SPOILERS FROM EARLIER BOOKS IN THE BACK BLURB). See more for the blurb! I am very excited to announce that I have signed a deal with Retropunk Publications to translate my series – The Steam Empire Chronicles – into Portuguese, and to publish the novels in Brazil. I am truly over-the-moon with this situation, so I figured I’d interview Guilherme Moraes, founder of Retropunk Publications. I’ll get to the Kickstarter news first! I’m excited to share that almost all of the Physical, Print Books have been placed in the mail today. I’ve spoken to the only exemption, but please know that digital versions will be on there way in the next few days. Day 18 – NaNoWriMo Battles Continue! When last we left our intrepid Romans (and villains, but that’s another chapter), they were busy trying to undo the damage of the Mongol invasion (and other things). The first handful of Kickstarter packages go out tomorrow. The remainder should go out Saturday! The books have a new matte cover and they look and feel awesome! PS Steel Praetorian’s been a bit paused, but we eeked over the 27,500 word line today. There simply aren’t enough hours in the day to get everything done! But progress is progress. We’re more than 1/4 of the way done with Novel #4 and it’s only been 2 and a half weeks! That’s epic progress for me, Mr. Slow Writer. Salve! 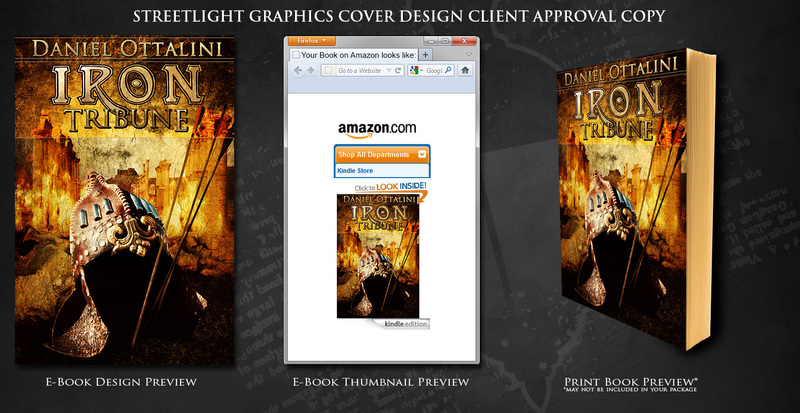 The launch of the Iron Tribune Kickstarter has begun! You can access the project here! $30 gets you a signed print edition of the novel, plus all three of my novels in digital form! That’s four books! I’m really looking forward to sharing this with you. Go on and check out the page with the brand new cover art! This is the concept I went with! I hope you enjoy it! Please share and pass the word to all your friends. This looks to be a great kickstarter event!